If you are to visit the official website set up by the Philippine government for its K to 12 basic education program, there's a section there that goes into details about the "salient features" of the program. Two of these "salient features" involve contextualization and enhancement [making lessons relevant to the learners by using examples and illustrations based on local culture, history, and reality] and mother tongue-based multilingual education [using the local language as the medium of instruction inside the classroom]. This is why public schools nowadays make use of textbooks that utilize contextualization and that are written in local languages. These are good concepts. They make complete sense. However, it becomes very problematic when some of the information in the books are erroneous or are totally untrue. Take for instance the recent discovery of another error in an Ilocano-language K to 12 book. In a lesson about various indigenous groups in the country, the book committed at least two errors in its description of Igorots. One, the book claims that Igorots live in the mountains of Ilocos Norte, Ilocos Sur, La Union, and Pangasinan. Two, the book further claims that Igorots in the Cordillera Administrative Region (CAR) can be found in "Italia". What is this "Italia"? Where can it be found? Are the writers of the book referring to the European country or are they alluding that there's a place within CAR called "Italia"? Here's the description as found in the book: "Dagiti tattao nga agnaed kadagiti il-ili a masarakan kadagiti probinsia to Ilocos Norte, Ilocos Sur, La Union, ken dagiti ili iti daya a paset ti Pangasinan. Iti CAR, makita dagiti Igorot iti Italia." Here's a rough English translation: "Igorots are the people living in the mountains within the provinces of Ilocos Norte, Ilocos Sur, La Union, and some areas in Pangasinan. In CAR, the Igorots can be found in Italia." Errors of this nature shouldn't even be possible given the available resources out there. It makes one to wonder if the writers behind these books consulted with people knowledgeable about the different indigenous groups in the country. Did they even perform standard research? Just a quick Google search will lead you to a fairly accurate resource about Igorots on Wikipedia. There's not a single sentence there mentioning "Italia". Looking back at the erroneous description on the book, it seems that the writers were referring to the Bago tribes. These are tribes that occupy the borders between the provinces of Region 1 and the provinces of CAR. There's no consensus as to whether they can be called Igorots or not. Some of them refer to themselves as Igorots while others prefer calling them Bagos. Photo courtesy of Rose Bacaoat via Facebook. 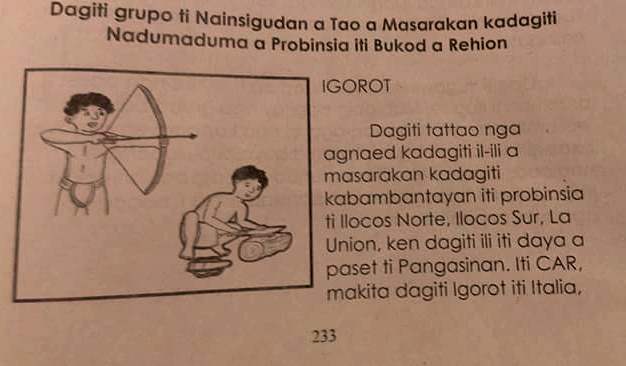 This is not the first time that wrong information about Igorots was found in a K to 12 book. Several months ago, a grade 4 workbook called Edukasyon Sa Pagkakatao said that Aetas are found in Mountain Province. The writers obviously got confused in the differences between Aetas and Igorots. What's so damning about this error is that the book had a consultant, three editors, thirteen writers, and two examiners. So it's mind-boggling that this army of writers and editors didn't spot the error before publication. After the discovery of the error, we sent an email to the Department of Education. We still don't know if the error has been fixed or if they're doing something about it. We are yet to receive a reply from them.